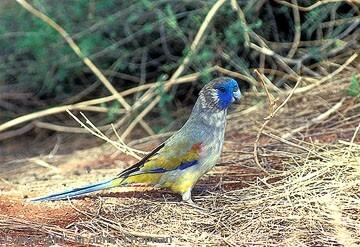 Once upon a time Naretha Bluebonnets were classed as a separate species and known simply as Naretha Parrots. They were also keenly sought after by the more extreme elements of the avicultural trade and illegal trapping was rife. Hopefully the change to subspecific status has improved that situation but there will always be individuals who simply have to own something different and "Narethas" are certainly the most distinctive of the four races of Bluebonnet. The Naretha Bluebonnet is the only form of Bluebonnet found in Western Australia. Restricted to a narrow zone of vegetation fringing the Nullarbor Plain known as the Myall Belt (see pic 298204), like all Bluebonnets they are particularly attracted to she-oaks which provide suitable nesting hollows, in this case Allocasuarina cristata. Not your every day parrot, very few people have ever seen one because they live in such a remote region. The road along the transcontinental railway line which traverses the heart of their habitat is not one to go on without an extra spare tyre! 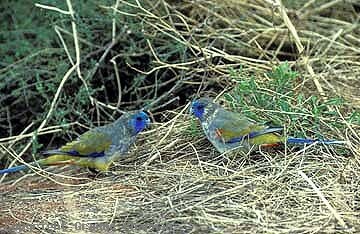 However, they were once recorded on the Hampton Tableland north of the main Eyre Highway between Mundrabilla and Eucla in acacia scrub but they haven't been seen again in that area for many years. The region they inhabit has a very low rainfall and is technically classed as desert. In such an extreme environment, "Narethas" obviously have to take advantage of whatever is on offer and to this end are known to eat a very wide range of food. 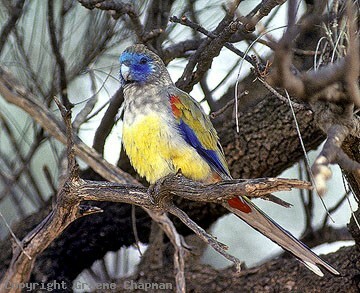 This is described in detail in Joseph Forshaw's excellent book "Parrots of Australia". Much of their habitat is now taken up by pastoral holdings where water for stock is permanent, but in areas to the north on the edge of the desert they are known to exist where there is no surface water, quite a feat for a parrot! Perhaps like some of the cattle now roaming our vast deserts they can get enough moisture by eating succulent herbage. 298204 ... 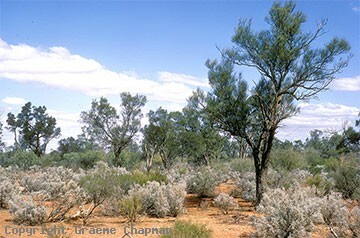 Ideal habitat along the trans line - She-oak (Allocasuarina cristata) and saltbush.